Several arms of the Ministry including the Immigration Dept, Police and the National Operations Centre (NOC) will be engaged in the illegal immigrant weed out exercise. “After the window closes, all persons who have not been regularised, we will be doing a massive campaign. 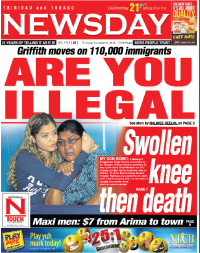 We will be like a parang side…we will be going from house to house and any person who is here illegally we will be sending them back to their country,” Griffith told Newsday. He said certain procedures and formalities are being worked out at present and this window of opportunity will be afforded to illegal immigrants in the next few weeks. Griffith said there are many illegal immigrants living in this country who are contributing heavily to crime and gang activity. He said if these undesirables are removed, it will have a positive impact on the fight against crime. The country will benefit when these illegal immigrants are returned to their respective countries,” Griffith said. “It goes to the concept of the ‘broken window theory’…people might not see this as a serious situation but it is, because we have intelligence that confirms there are many persons who are here as illegal immigrants and who are involved in all aspects of drug related activity and serious crimes. “It is not coincidental that this problem started just around the same period of the escalation in gang activity, around 2004 or 2006, so it shows there is a relationship between illegal immigrants and serious crimes,” Griffith told Newsday. Griffith made it clear that not all immigrants are involved in crime. He said immigrants have contributed to this country’s development but those upstanding citizens are the ones whose status are above board and are not in this country on the sly. He said it is his duty as National Security Minister to treat with the issue of illegal immigrants seriously in order to nip the problem of illegal immigrants being involved in crime in the bud. Griffith said this initiative does not mean that all illegal immigrants will be targetted for deportation hence the reason for a window of time and opportunity being afforded to them to check with the authorities to have their status updated. He believes many of these immigrants can make a meaningful contribution to society but they must do so as properly documented immigrants with a legitimate reason for being in the country. “If we see you are here working illegally and if you have not regularised and registered it means you are not paying taxes. You are not taking out NIS from your employees, you are not paying Corporation tax. It means you are indirectly cheating on the State. “Illegal immigrants are utilising the education system, health system, employment opportunities. Listen, Trinidad and Tobago welcomes you with open arms but you must be regularised. So we are giving these persons a chance to come forward during this brief window of opportunity because if we find you afterwards we will automatically send you home. “Come forward, regularise yourself, take your pain and if you have an employer who can vouch for you and we are told you can be of value to the country and you do not fit the two criteria instrumental in removing you, that is, (a) being a liability to the public purse, you don’t have a job, we don’t know where you are living, you don’t have any employer, you have no skill or (b) you are a threat to National Security…if you do not fit these categories then you stand a very good chance of being regularised,” Griffith said. Gary is doing the right thing send back the undesirables but please Gary monitor border security because they are letting a lot of these folks in. Some of these immigration officers not the juniors but the seniors should be fired.